The haunted location of Greenwood Cemetery has been known for many years because of its many ghost stories and legends. 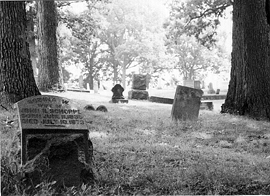 GREENWOOD CEMETERY in the south end of Decatur, is possibly one of the most haunted sites in the Midwest. It was incorporated in 1857, but on one really knows when it was started but burials took place there as far back as the 1820's. After nearly a century, the graveyard was in poor condition. The grounds were overgrown and grave robbery was common. Tales of ghostly apparitions and misty forms have been collected over time, including tales that have endured for decades like the Greenwood Bride and the story of the Barrackman staircase, where the ghost of a weeping young woman has been reported. The old public mausoleum at Greenwood is remembered as one of its most haunted spots. Sadly, it no longer remains today.. although its destruction is a ghost story in itself! 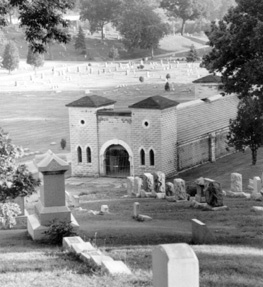 One of Greenwood's haunted and lost locations is the old mausoleum, which was torn down in 1967. The building had been in terrible condition at the time and rumors circulated of strange screams and lights that could not be explained. The mausoleum was emptied prior to being torn down and unclaimed bodies were placed in a common grave across the road. Recent paranormal investigations have detected strange activity is still emanating from this location. On this hill is where the Greenwood Ghost Lights have been reported for decades... they remain one of the cemetery's enduring mysteries. Another of Greenwood's legends are the ghost lights that have appeared for several generations on the southern edge of the graveyard. The lights are said to be the spirits of lost souls whose bodies were washed away by a flood many years ago. The spirits are said to be searching for the places where their bodies are now buried. Greenwood's most notorious haunted spot is in the Civil War section. During the war, Decatur was frequently visited by prison trains carrying Confederate prisoners to camps. One of these trains contained a number of men who had died from Yellow Fever while en route. The railroad tracks passed close to the cemetery so a wagon was used to carry away the dead. 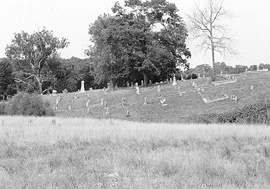 The prisoners were buried in an unmarked grave on the side of a hill near where the War Memorial section is today. The grave was quickly dug, but in the haste, it is believed that some of those soldiers may not have actually been dead. There are many who say that these soldiers still walk the hills of Greenwood Cemetery and many other claim to have an uncomfortable feeling in this area. One man even says that he encountered one of the soldiers in person. He was walking through the cemetery one day when he saw a man standing among the tombstones. He gestured and the man went closer. He noticed that the fellow seemed to be wearing a tattered uniform of some sort and look very confused. "Can you help me?" the man in the uniform asked, "Where am I?" The other man looked at him closely and saw the fear in his eyes, then he got a chill down his spine as the man in the uniform spoke again. . .
"I just want to go home," the man said softly and then he vanished. Greenwood Cemetery is located at the dead end of Church Street in south Decatur. It is open to the public from sunrise to sunset daily.